1. To enter the Offer, you must state Offer Code REG53 when registering. All registrations are subject to verification procedures. 2. After the registration has been confirmed you may start making deposits. 3. Geoff Banks will award up to 10 x £10 in real money credits for every £100 you generate in turnover, with each wager over 1/2 in odds (or cumulative). Therefore turnover just £1000 to gain a maximum of £100 in total from this great offer! 4. Each time you turnover £100 it is your responsibility to notify us using the form below and we will apply your real money credit. 5. After each successful claim for your real money credit your turnover requirement will be reset to zero. It is therefore critical that you use the form below to claim your credit in a timely matter. The reset of turnover will only occur after you notify us. 6. This offer cannot be used in conjunction with any other offers and real money credit shall not count towards our weekly rebate offer nor other Geoff Banks promotions, and offers. 8. Offer is limited to one per person, family, same or similar address, e-mail address, telephone number, same payment account (i.e. debit or credit card), mobile device (i.e. mobile or tablet), application download, shared computer (i.e. public library or workplace), IP address. 9. Geoff Banks reserves the right to withdraw the offer from any customer and/or group of customers (i.e. 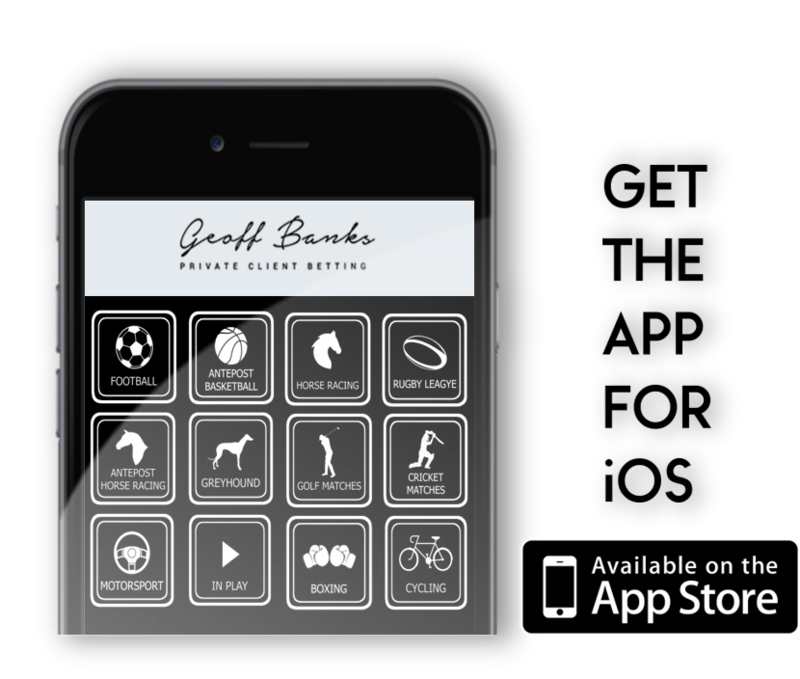 those that may be linked through a referring website, messaging service, arbitrage alert service or betting system) at Geoff Banks’ sole and absolute discretion. This may result in real money credit forfeiture, voiding wagers and closure of accounts. In addition, Geoff Banks reserves the right to levy an administration charge on the customer to cover administrative costs of investigating such incidents. Such decision shall not be subject to review or appeal. 10. Geoff Banks reserves the right to void any real money credits and bets placed with winnings generated from those credits if we believe that the promotion has been abused or where irregular/suspicious betting patterns have been discovered. This may also result in possible closure of customer account. In addition, Geoff Banks reserves the right to levy an administration charge on the customer to cover administrative costs of investigating such incidents. Such decision shall not be subject to review or appeal. 11. Geoff Banks reserves the right at its own discretion to vary, cancel, refuse or terminate the offer at any time without notice. 12.Geoff Banks here and Rules of Betting apply.